SHE LIED! Hillary’s Tearjerker About Handicapped Girl in Wheelchair in DNC Speech WAS ALL A LIE! Aesop’s fables were more believable. See the Stunning Moment Dallas Sheriff’s Moment of Silence for Fallen Officers Is Interrupted at DNC: Professional malcontents spit on the memory of those whose boots they are not worthy to kiss. Gary Johnson’s Religious Freedom Position Needs Some Critical Analysis -A better argument is required than a fear of a slippery slope. If it is a slippery slope Mr. Johnson is worried about he would do well to fear the one beginning with an assumption that some citizens have the right to make other citizens their servants. Trump: Clinton and DNC ‘Trying to Rig the Debates’ Why not, she got away with rigging her party’s nomination. Navy to name ship after gay child molester. Obama’s Secretary of Navy already sent the notification about the “USNS Harvey Milk” to Congress. It’s a Military Sealift Command fleet oiler… insert suitable wisecrack here. Why is there a hole in Hillary’s tongue? Either she had a biopsy on her tongue or she needed a hiding place for smuggling diamonds. Soaring Chicago Gun Violence Amid ‘Toughest Gun Laws’ Crushes Clinton Narrative For More ‘Controls.’ What they need is thug control. But when you have aldermen and other city officials cutting deals with the gang-bangers for votes, it’s obvious why Chicago will always have high homicide rates. Hedge-Fund Handouts: Hillary Clinton $48,500,000 – $19,000 Donald Trump. Never worry, Hillary will go after wall street like a pit bull on steroids, OK, maybe like a toothless 20 year old chihuahua. Another disease outbreak among gay men: meningitis. Add this to HIV and every other form of STD, clinical depression, body image neuroses, substance abuse, domestic violence, various bowel disorders lumped under the classification “gay bowel syndrome,” lice, pinworms, scabies, and flea bites, all of which occur among gay men at a much higher rate than among the general population. But still we are supposed to teach our youth that the gay lifestyle is okay. Venezuela’s new decree: Forced farm work for citizens. Starting to sound like the People’s Paradise of North Korea. John Podesta snaps at James O’Keefe: ‘Just get lost!’ Some campaigns run on the truth and some campaigns run from it. Andrea Mitchell Calls Obama Greatest Speechwriter Since Lincoln: This statement would be fraudulent even if Obama had written this speech. We’re fairly certain that he did not. How can we be so certain? Because not once did O Duce mention his time-traveling parents, seeing dead-people at Memorial Day events, fifty-seven states, the intercontinental railroad, corpse-men, cinco de quatro, obee-guy-knees, giving breathalyzers to treat asthma, uh-uh-uh-if-if-if-if or any of that other okie-doke. Chelsea Clinton to Ivanka Trump: How you gonna make equal pay happen? Chelsea originally wanted to ask her parents this question but couldn’t as her mother was preoccupied underpaying female in the workplace and her father was too busy sexually assaulting them. San Diego Police Shooting: One Officer Killed, One Rushed to Surgery. RIP. Another gun control success story for Jerry Brown and Gavin Newsom. A breakthrough in comprehending Democrats. A donkey ride company in London invented technology that interprets donkey “ee-awws” and facial expressions, translating them into English sentences. Could come in handy since both political parties are running a Democrat for president this year, eh? The Obama economy. The home ownership rate has been plummeting since he entered the White House and is now the lowest it’s been since 1965. Glenn Reynolds: After DNC hack, the case for paper ballots. At least they have to work at it with paper ballots. It takes time to bring trunkloads of ballots to the polling place. WATCH OBAMA REFER TO HIMSELF 119 TIMES DURING HILLARY NOMINATING SPEECH. Our comment to Hillary last night, which was way before he ever mentioned Hillary by name. Fact check on Night 3 of the Democratic convention: Obama’s false claims, Kaine’s serial offense. 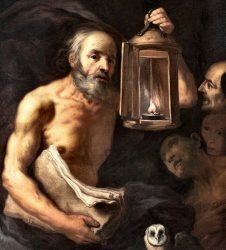 Diogenes is rolling in his tomb laughing. Baltimore Rioters Pushed The Police OUT…Now Guess What They Want Now? Um…the police? This is what the police in San Francisco, Oakland and other cities where they’re unappreciated should do. Perhaps people will appreciate them again when they find out how uglier society gets without them. 4 brutal poll numbers that greet Hillary Clinton at the Democratic National Convention. They’ve also been running ads to fill the empty seats to replace all the Bernie voters who’ve left. Germany: Suitcase bomb detonated near immigration reception centre — ‘Arab men’ fled scene. Probably just German NRA members with suntans dressed in mufti. IRS Launches Investigation Of Clinton Foundation. 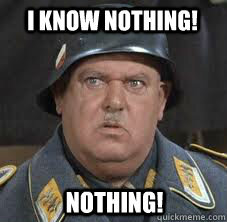 We hear they hired Sargent Schultz to be the lead investigator. Charges dropped against the three remaining officers in the Freddie Gray case. About time. Now when are they going to drop Marilyn Mosby?